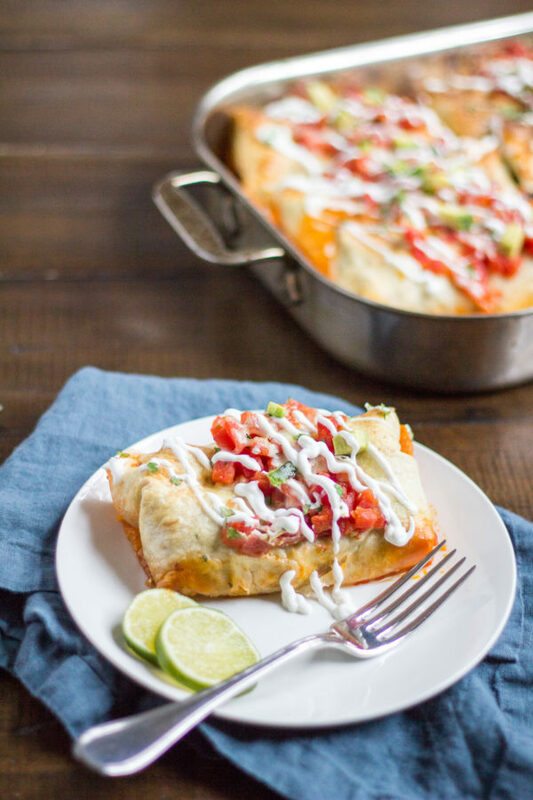 Baked Chorizo and Queso Chimichangas is a recipe with bold meaty flavors and a hint of spice. And this recipe takes just 30 minutes of active preparation time. 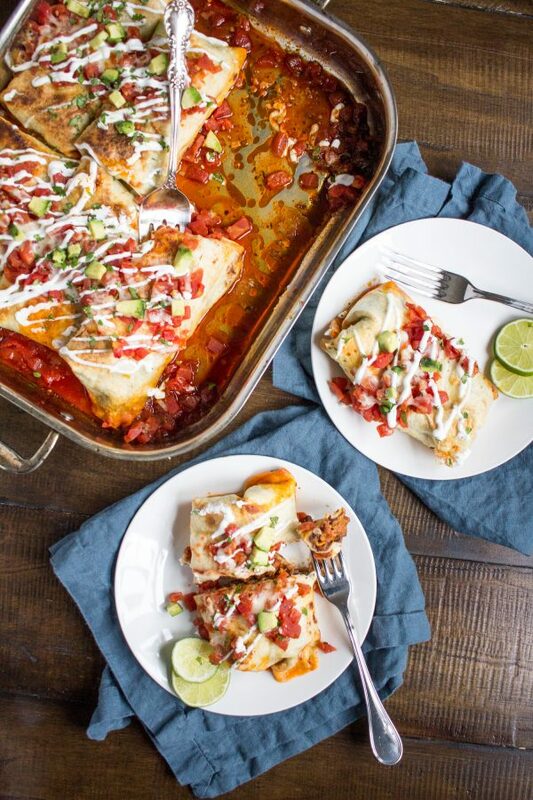 I am bringing chorizo, queso, and chimichangas together for a delightful and unexpected meal. 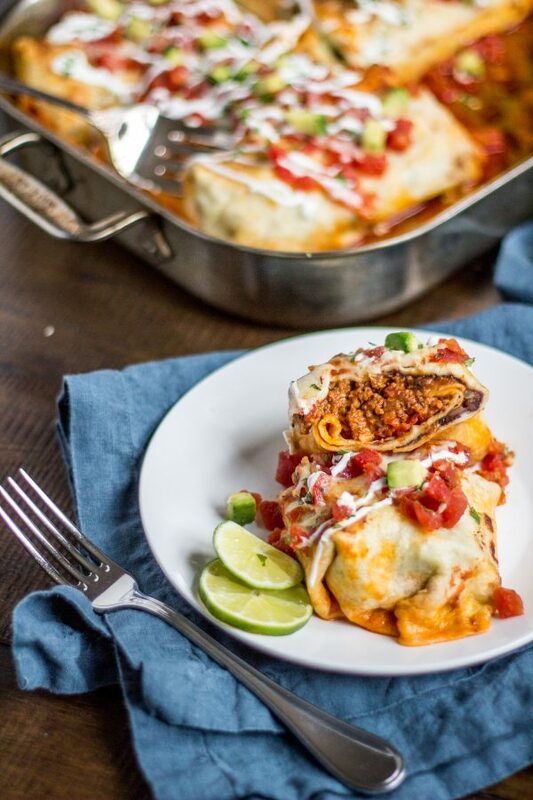 These Baked Chorizo and Queso Chimichangas are stuffed with refried black beans, sautéed onion, chorizo, queso, and tomatoes. It is a recipe that comes together in under 90 minutes, and only involves about 30 minutes of active preparation time. I love to make a big batch so that we have leftovers to eat throughout the week. 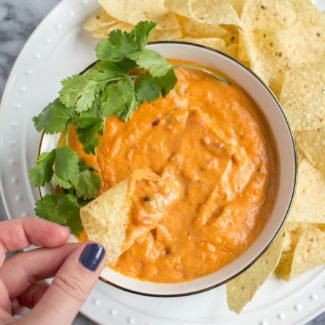 The secret ingredient to this recipe is my Comeback Queso, a homemade queso seasoned with chili sauce and a blend of spices. 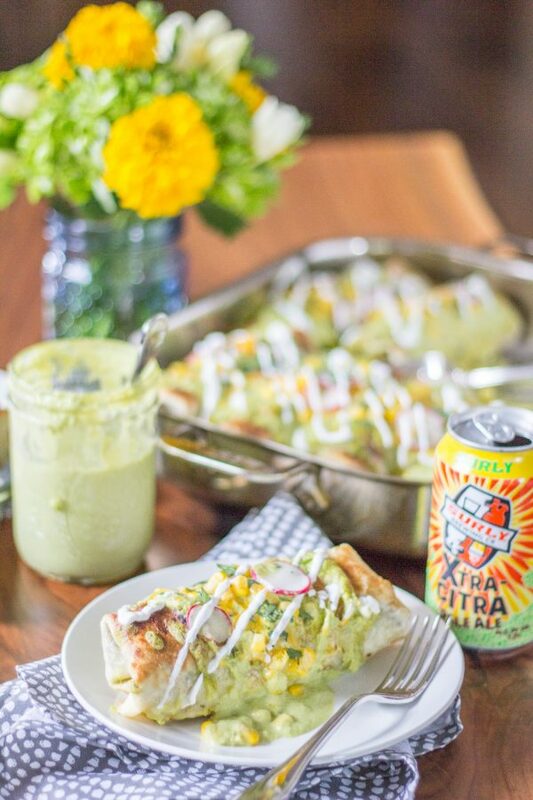 The comeback queso recipe makes a big batch, and I used about half of it in these chimichangas. Once the queso is ready, I just sauté some chopped onion and add the chorizo cooking it until it has browned. Chorizo is already so wonderfully seasoned with spices that you don’t need to add anything extra. 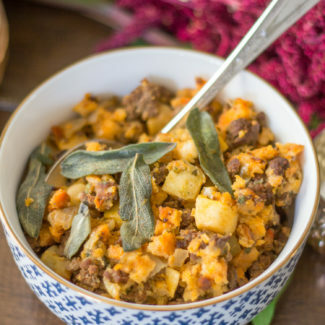 You can either use ground chorizo meat (if you can find it) or chorizo that is removed from the casings and crumbled up. 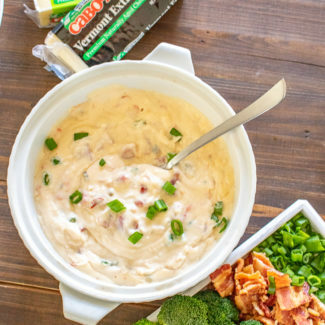 I absolutely loved the combination of the chorizo and queso, but if you really want to save yourself a bit of time and effort, you could substitute the queso with shredded cheddar and monterey jack cheeses. Once the chorizo has browned, I spoon in some queso and mix it all together. Assembling the chimichangas is easy. I spread a bit of refried beans on the top of a tortilla. Then I add a big scoop of the onion, chorizo, and queso mixture. A scoop of diced tomatoes goes on top, and then I roll up the tortilla, letting the refried beans act as glue holding everything together. You could go off script and add some of your favorite ingredients. If you want to add extra spice, use salsa instead of diced tomatoes. 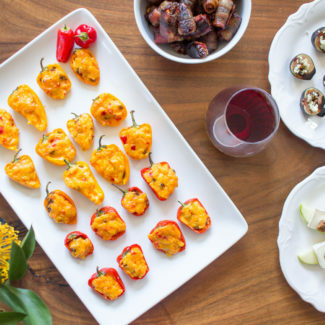 You could also add roasted bell pepper or poblano pepper, rice, or green chilis. A sunny side up egg is a fun topping. 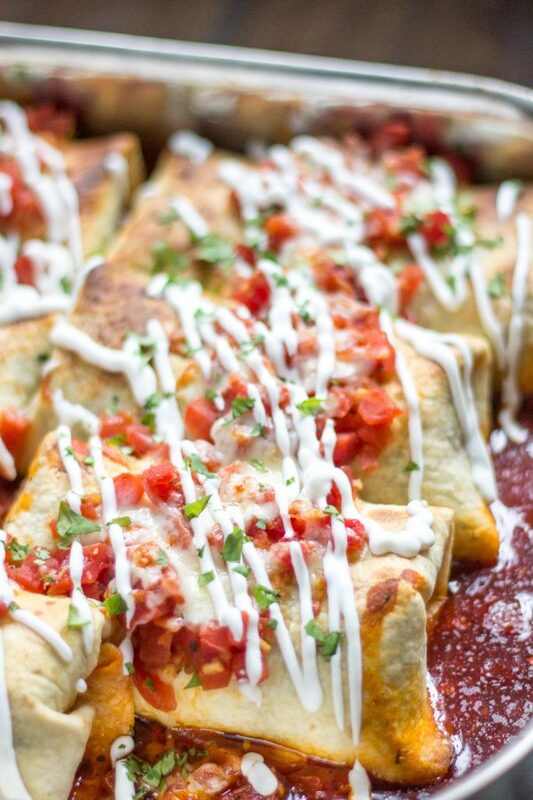 Traditionally, chimichangas are fried, but I prefer to bake them. It is easier and healthier. After I roll up all of the chimichangas, I brush them with olive oil which helps them to brown while they bake. 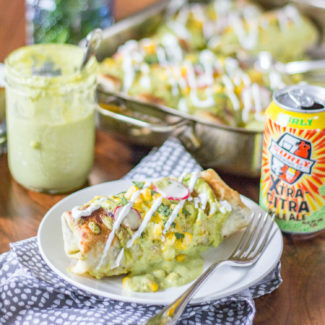 If you want to try another chimichanga recipe, here is my recipe for Chicken Chimichangas with a Poblano Cream Sauce. You want to make the queso first. Once the queso is ready, keep it warm over low heat. Heat 1 tablespoon of olive oil in a skillet over medium heat. Add the onion and sauté for 4-5 minutes, until it is translucent. Then add the chorizo, using a wooded spoon to break it up into small pieces. Cook the chorizo until it has browned, then spoon in the queso, and stir to combine. 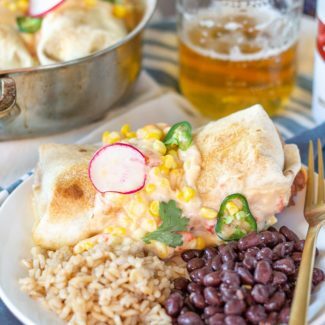 Heat your oven to 350 degrees and then get to work assembling the chimichangas. Lay out a tortilla on a work surface. Spread about 1/4 cup of refried beans across the top of the tortilla. Then add a 1/3 cup scoop of the chorizo mixture below the refried beans. Lastly, add about a tablespoon of diced tomatoes. Roll up the tortilla, first folding the sides over, and then rolling it up burrito style. Repeat using all of the chorizo mixture. 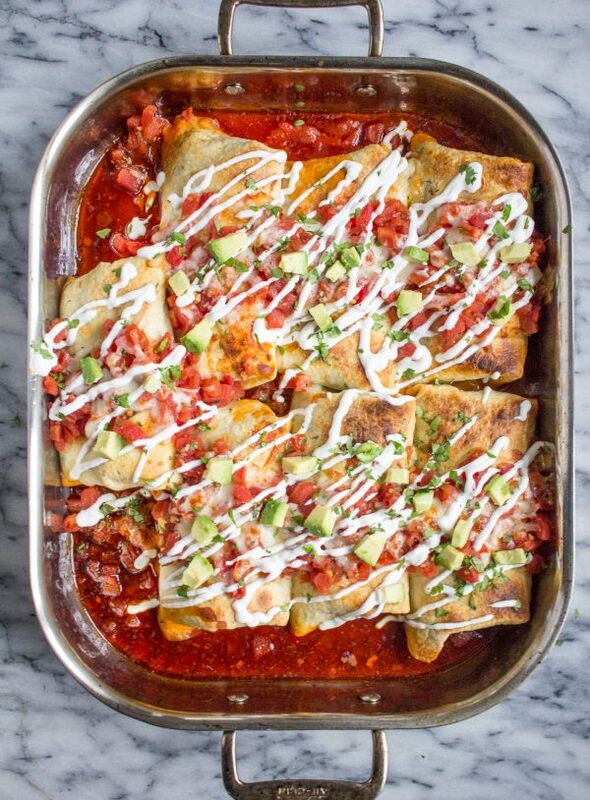 Arrange the rolled up chimichangas in a baking pan, and brush the remaining olive oil over the top. Let bake for 45 minutes, until the tortillas are starting to brown. Then pour the remaining diced tomatoes over the top of the chimichangas and top with the shredded cheese. Bake for another 15 minutes. 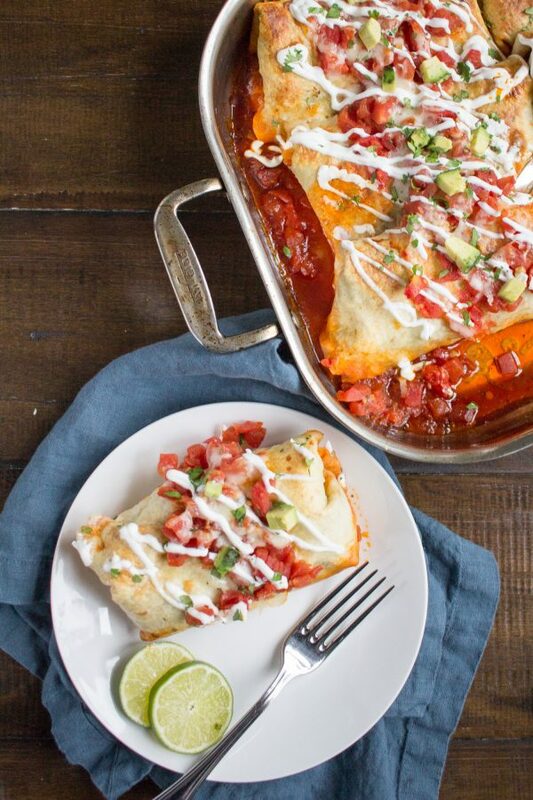 Serve the chimichangas with sour cream and some diced avocado.